College application due dates vary depending on the school you're applying to, and sometimes the specific program. That being said, they do have some things in common. First of all, if you plan to begin in the fall semester, which most college students do, you generally need to apply by the preceding January at the latest. This gives the admissions department time to sort through what can be tens of thousands of applicants in time for everyone to enroll and register. If you're applying for a January start, you will have less competition, so you can often apply as late as September or October. If you're applying for a summer start, it's best to have your application in by March or April at the latest. There are two exceptions to these general due date guidelines. The first is if you're applying to a very competitive school or program. In this case, you may need to have your application in much earlier, and you also might have to schedule one or more in-person interviews. The second is if you are applying early action or early decision. If you choose one of these options, you are saying to the school that if you get in you are committed to going there; you will not change your mind and go to another school instead. In exchange for a less competitive admissions process, you often have to have your application in for fall by the previous November. 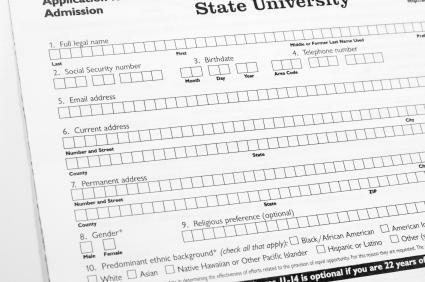 If the college you're applying to has its own application, it may have the due dates printed directly on it. If you're using a common application, you will have to check any print literature you've received from the school or the school's website or contact someone in the admissions department. Note that college application due dates are not suggestions. They are almost always firm deadlines. In most cases, the deadline is the date when the application must be received. Some colleges do accept late paper applications postmarked by the due date to allow for discrepancies in the postal service, but you shouldn't count on that being true. You may be able to squeak by if you're an outstanding prospect or you have a good excuse, but it is best not to risk it. You don't want to have to put off school for six months because you couldn't make it to the mailbox. To ensure that your application arrives in time for consideration, it's best to send it in at least a week before the deadline. A week before that, make sure you have all of the supplementary materials you need. This can include your high school transcripts, your SAT or ACT scores, your admissions essay, and your letters of recommendation. If anything is missing, it's urgent you find it then. If necessary, have it delivered overnight or via fax or email. While you can often send in your application online, you may still have to send these additional materials the old-fashioned way. While getting your application in early may not ensure you get in to a particular school, it certainly doesn't do anything but help your chances. If you want, you can wait a week and then call the admissions department to ensure they've received your application package, or you can send it certified mail. If you submit all or some of your application online, you may receive an automatic confirmation message.